SAN FRANCISCO, Nov. 27, 2018 /PRNewswire/ -- FARMFOLIO, a Cayman Islands-based agriculture development firm, closed the second round of funding for its Colombian farming operation, Pietrasanta. The project encompasses 570 acres of organic coconut development and Colombia's first certified coconut nursery. 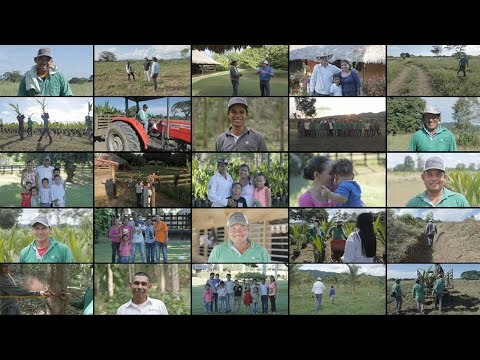 Since launching in 2015, Farmfolio has connected global investors to international farming opportunities throughout Central and South America. The PIETRASANTA project brings together investors from the United States, Germany, Switzerland, Russia, China, Singapore, Australia, the Netherlands, New Zealand & Canada. According to Farmfolio's Head of Investor Relations, Thomas Connell, this unique and game-changing asset is expected to yield average annual returns of 20.74% over a 20-year period. Aside development endeavors at Pietrasanta; phytosanitary and nutrition programs to ensure proper development of plants in their new permanent homes has been nothing short to relentless. The organic process requires an increased level of attention and creativity to mitigate disease risks and maximize plant nutrition. Throughout the year the plantation has experienced tremendous growth in tree sizes and increases to plant health. PIETRASANTA launched its first offering to develop this new venture during Q2 2016, which successfully raised US$2.575M. Since then, Pietrasanta has increased its actual valuation thanks to continued upward trends in coconut demand and the addition of a teak processing facility to its operation during 2018. Since launching its second round of funding, the Pietrasanta team has successfully planted and developed over 40,000 coconut trees and completed the certification of its organic nursery & plantation. The project has gathered national attention in Colombia and plans to host international buyers throughout 2019 as it prepares for 2020 harvests. During Q2 2018, the farm received the first official ICA (Colombian Agricultural Department) Certification in the country, thus becoming the only source of exportable Colombian coconuts to date. More recently, Pietrasanta also received its plantation certification, which paves the way as the farm gets ready to apply for Global GAP and USDA organic certifications in 2019. Farmfolio currently focuses on agriculture opportunities in the categories of tropical fruits, vegetables, and sustainable hardwoods located in Central and South America. In total, Farmfolio's management team has already marketed and implemented three development projects using its new and innovative platform. Although the PIETRASANTA offering is now closed, the agribusiness development company plans to launch new projects in 2019 targeting Chile, Mexico, Panama & Peru, according to Farmfolio's COO, Oscar Baracaldo.